Kudos to Manic Productions for bringing the beardo psych-pop of Brooklyn's Woods to the Toquet Teen Center in Westport tomorrow night. Their latest, Songs Of Shame , has been in heavy rotation in CT Indie headquarters of late. It has all the hallmarks of experimental lo-fi recording (fuzzed-out doubled vocals, octave harmonies, questionable tuning, experimental leanings), but with enough catchy hooks to make it all worthwhile. 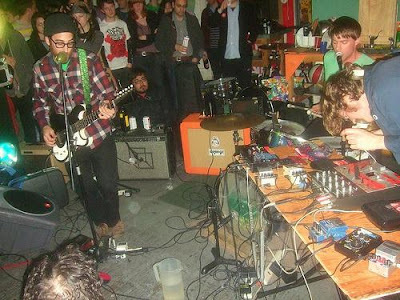 Pitchfork.tv has a recent show from the Market Hotel that will certainly whet yr appetites. Perfect for all you hipster fucks. Danielson is heading up from Clarksboro, New Jersey to play some indie pop gospel music. The group consists of frontman Daniel Smith and a number of various artists with whom he collaborates. The band is known for Smith's squeaky falsetto vocals, innovative musical arrangements, and matching nurse uniforms. For fans of Sufjan Stevens. This is also a CD release show for local softies Midi & the Modern Dance. The alt.country strummings of New Haven's Sidewalk Dave start things off. This show is at the Toquet Hall Teen Center. If you are not a student and wish to attend please call Kevin at 203-341-1155 and you will be put on a list to ensure entry (if the show doesn't sell out in advance) Tickets are available at the Toquet Hall box office only.